CardMonkey's Paper Jungle: New Cricut Cake! This is likely not what Cricut had in mind when they marketed their new Cricut Cake machine ... but it is the first cake I made with my new Cricut Cake. 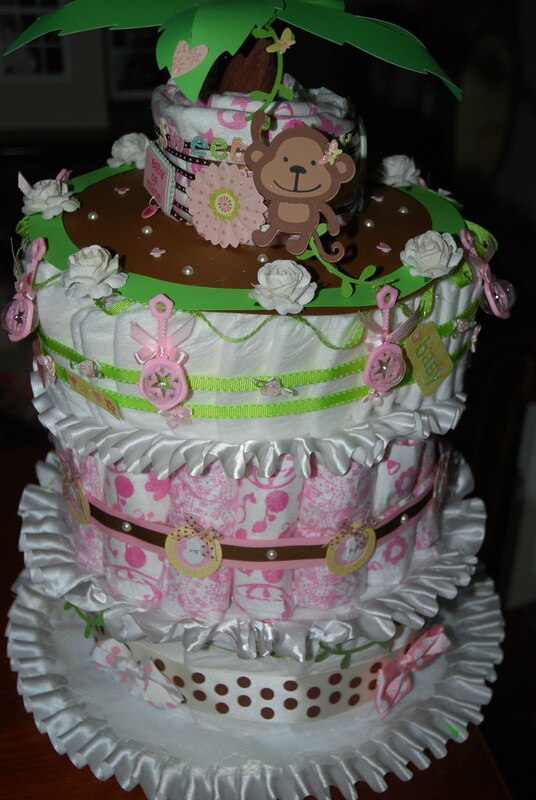 It's a diaper cake for my daughter Emily's upcoming baby shower. And yes, I made it using my new Cake Basics cartridge that came with my Cricut Cake machine bundle. Thank you, Mr. Smiley (hubby) for giving me my birthday gift early so I could play on this rainy Sunday. I used the Cake Basics cartridge to cut the large "chocolate" paper icing layer on top, as well as the lime green ring that adorns it. The leaves for the palm tree were also cut using that cartridge; instead of using them flat at the vein opening, I curled them and overlapped them to give them dimension. See the white paper roses at the top? I'd normally cut each of those petals using my flower punches by Punch Bunch. BUT Cake Basics comes with a lot of single leaves itself, so I set the Cricut to "auto fill" for the 1/2" white petal, hit cut and went about the chore of trying to organize my craft loft. When I returned, some 300 petals were cut from a single 12x12" sheet! Boy, did that save time with the flower punch! In case you're wondering, the middle layer of the "cake" was made using new printed "designer" Pampers. A single pack has the two complementing designs of pale pink and darker pink. There are also boy colors too, though I wonder if "Real Boys" would wear designer diapees? I had so much fun making this cake, it should be illegal!